“The Legend of Zelda” is one of the most revered and beloved video game series. All of the “Zelda” games are incredible experiences, and many of them have brought forth numerous innovations to the medium. In spite of its predecessors, the latest game in the series, “The Legend of Zelda: Skyward Sword,” may be the strongest yet due to its improvements to the classic “Zelda” formula and its meaningful incorporation of motion controls into the core experience. As “Zelda” games are often very long, with the latest game boasting somewhere between fifty to one hundred hours of gameplay according to Nintendo, I have not yet finished “Skyward Sword.” My impressions of the game are based on the first fifteen hours of gameplay, in which I have finished the opening, the first two dungeons and a few side quests. “Skyward Sword” is the earliest game in the “Zelda” timeline. The story begins with Link living in Skyloft, a series of islands floating in the sky above Hyrule, and after Zelda is kidnapped Link sets out to save her. While the basic plot is straightforward at this point, numerous small changes to the classic formula keep the game far more entertaining than expected. The opening sequence proceeds at a much quicker pace than that of “Twilight Princess” thanks to a strong supporting cast of characters. As Link is training to be a knight at an academy, his place in the world is much more certain than ever before. His classmates, teachers and the rest of the town all have strong personalities that come clear across even without voice acting. Not since “Majora’s Mask” has there been a “Zelda” game with such interesting characters. I appreciate that in return trips to Skyloft, the side quests continue to involve different characters so that no one feels left out. Since the Wii launch title “Twilight Princess” was originally a GameCube game, “Skyward Sword” is the first Zelda built from the ground up for the Wii. That fact is most evident in two distinct ways: the watercolor art style and the Wii Motion Plus control scheme. The game’s new art style is immediately striking, as up close, it may resemble a cross between the more realistic style of “Twilight Princess” with the cartoon look of “Wind Waker,” while in the distance, the colors are blurred to look like an impressionist painting. “Skyward Sword” is definitely a beautiful game, especially in the characters’ animations, though the Wii’s lack of power definitely hurts its overall vision. The blurring of the colors looks great far away, but it often feels like it happens too close to Link. The other, and far more important change, is the new control scheme focusing on motion controls. Wii Motion Plus is required to play the game and factors heavily into nearly every activity Link does. Combat sees the most obvious improvements, as the Wii Remote becomes Link’s sword. It isn’t exactly 1:1 motion control, but it detects the angle Link is slashing at, as well as jabs, in battle. 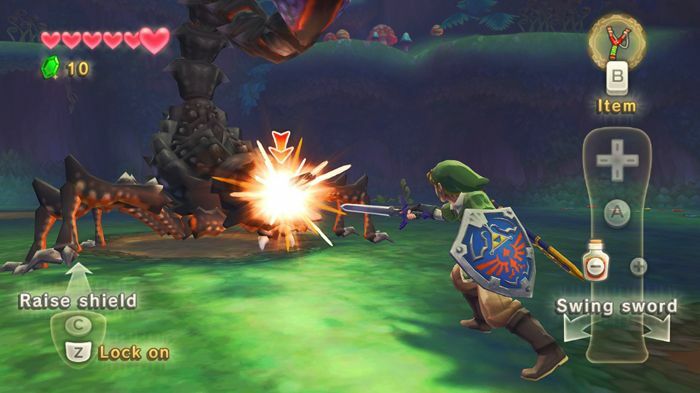 Wildly waggling the controller does not work in “Skyward Sword,” as most enemies will easily block and counterattack. Instead, precision, and knowing exactly when and how to exploit the monsters’ openings in their defense, is key. The new control scheme finally makes combat an exciting prospect in a “Zelda” game and is as sophisticated as the dungeons’ puzzles. Wii Motion Plus is also used in a wide variety of activities, like flying your bird, catching bugs with a net and throwing or rolling bombs on the ground. None of the experiences feel gimmicky, and I was also pleased with how Wii Motion Plus removes IR targeting on the menus with a far more intuitive cursor based on the angle you are holding the remote. Yes, you do have to re-center the Wii Remote every once in a while, but “Skyward Sword” is the first truly compelling case for motion controls. I never want to play “Zelda” again without motion controls as it is a far more engaging game because of it. “Skyward Sword” is the most exciting Zelda game in a long time. It is as significant an advancement as “Ocarina of Time” was to the series and the rest of the industry thirteen years ago. Not only is it a more modern “Zelda” in regards to pacing and story, it is a fundamental step forward in how games can be played. “Skyward Sword” is the first real game to fulfill the promise of motion controls and is another phenomenal entry in the classic franchise.